Tableau outstanding and remarkable features and services are what make it the perfect tool for improving profitability. It can help you to explore your data to understand trends and design new processes. Monitor the success of your processes and analyze metrics to maximize the value you get from your marketing data. 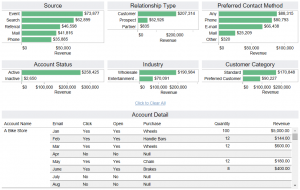 Analyze campaign revenue based on market opportunity data. Track key campaign metrics and view overall performance as a funnel. 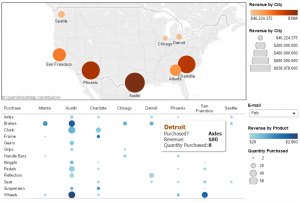 Analyze geographical buying behavior based on product types. Drill down to specific account detail by using demographic filters and search. Analyze campaign revenue trends When your campaign database includes various regions, sources, industries, and other slices it can be difficult to analyze what is working, where, and why. 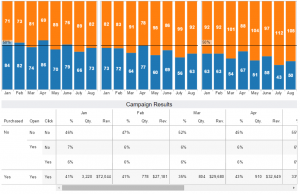 With Tableau you can make quick work of your campaign analysis. Slice revenue by market, campaign, or demographics so you can improve your campaigns and your market segmentation. Use the territory filter to break down your revenue month by month and figure out what products these regions were most interested in. Analyze geographical buying behavior A large part of marketing analytics is trying to understand where your largest markets are and what specific buying behaviors or habits exist. With this information you can better segment and tailor your marketing messages to each market for the best results. The pain alleviated in this case is geographically viewing your markets and visually understanding their opportunity size along with specific buying behaviors. The first view is a heat map showing the sum of annual revenue or opportunity size of each market on both size and color for emphasis. It is easy to identify what your largest markets are and where you would expect the majority of your sales to come from. In the sheet below is another heat map with the regions broken down by each product and what their specific buying behavior is for each of those products. Revenue is displayed by color and the order quantity is displayed as size to give the end user a complete idea of individual region buying behaviors. Identify your best and worst audiences Use demographic filters to slice your account records and find similarities and trends across campaigns and accounts. In this dashboard you are presented with three global filters of territory, state and email month as well as six sheets that can be used as a filter to better segment your metrics and find trends or patterns in various segments of your database. These filters will help break down and drill into specific niche markets or difficult regions to read behaviors and get specific account details and their actions throughout the email campaign. Discover brand insights and better understand brand awareness by customer segment Understanding customers is a key to success for every brand. How do the habits of one segment differ from that of another? What about regional preferences? Marketers today rely on data to deliver actionable insights and drive informed decision making. Quickly learn about preferences among customer segments and discover underlying brand loyalties with data collected from customers. Value shoppers tend to prefer the well-known brand with a lower price point while holiday shoppers purchase the niche, specialty goods. 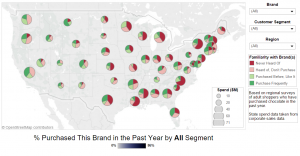 You can also visualize in which state or region particular brands are performing best – and worst.